You can find one of winter’s most famous constellations – Orion the Hunter – plus see the Milky Way tonight. Orion is bright and can be seen from inside smaller cities. For the Milky Way, you will need a dark sky! On these evenings in early to mid-December, the constellation Orion rises over your eastern horizon 2 to 3 hours after sunset. Orion swings south to his highest point around midnight, then sets west about an hour before sunrise. Because Orion is out for about 12 hours a night in December and January, we tend to associate Orion with the winter season. Many of you know this constellation from summer, though, when it rises in the east before dawn. Our sky chart shows Orion for an hour or two after night begins in December. The three stars of Orion’s belt jut pretty much straight up from the horizon, with the bright ruddy star Betelgeuse shining to the left of Orion’s belt and the bright blue-white star Rigel to the right of the Belt. 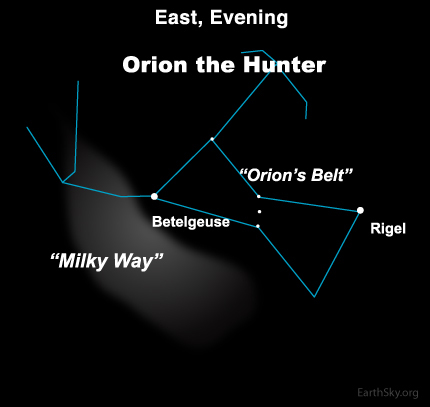 Because so many people are familiar with Orion, this constellation is a great jumping off spot for finding the pathway of stars known as the Milky Way. When we look at this band of luminescence, we are viewing the galactic disk edgewise – the combined glow of millions of stars. Given a dark sky, you can see this archway of stars running by Betelgeuse. The Milky Way arcs from east to west this evening, passing through the constellation Cassiopeia the Queen to the north and the Northern Cross in the west. Site contents copyright © 2019 Recorder Online	except as noted. All rights reserved. | 88 queries in 2.092 seconds.